Polar Fitness Tracker Loop2 - with notification funktion via Bluetooth Smart. 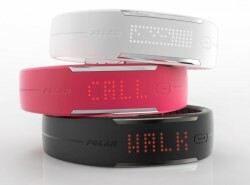 Delivery includes: Polar Loop2 Activity Tracker, USB cable, Quick-Start guide and a tool kit. Optionally the product is delivered as offer set incl. Polar chest strap H7 at the indicated special price (instead of German recommended retail price: 189.90 Euro)! Instead of the Polar H7 chest strap in black, which is provided as standard for ordering this set, you can also optionally get delivered the H7 chest strap in pink or blue. Please enter your preference when you place the order. Like its predecessor, the Polar Fitness Tracker Loop2 motivates you to create an active daily life - 24 hours a day, 7 days a week. The Polar Fitness Tracker Loop2 registers every movement and shows the level of ativity and reminds you, when you did not move enough. Besides the daily activity, the trendy Polar Loop2 wristband made of comfortable silicone and stainless steel, displays burnt calories, covered steps, time and - when an optionally available chest strap (Polar H6 or H7) is used - the heart rate and the current training effect (Fit & Fat). In addition, the function "Activity Benefit" gives a daily, weekly, and monthly feedback about your activity and sleeping time. Always "Up-to-Date": the notification function (Smart Notifications) makes it possible. NEW: Compared to its predecessor, the Polar Activity Tracker Loop 2 reminds of notifications for incoming calls, messages, emails and calendar entries (for iOS, Android follows) by symbols and vibration. (In-)activity times are now displayed with illustrative signs on the Activity Tracker wristband. Its predecessor gave this information only via the Polar Flow Mobile App (i.e., Apple App Store ) or the Polar Flow Webservice (www.flow.polar.com). Many other functions are given via both analysis tools: a qualitative and quantitative view of data, training planning, a detailed training analysis, and the sharing functions (Facebook, Twitter, etc.). NEW: The Polar Fitness Tracker Loop2 is delivered with an advanced battery (38 mAh instead of former 22 mAh) and thus an extended capacity of 8 days (for 24/7 activity tracking and 1 hour training a day). You recognize quickly how small changes in daily life and the acquirement of daily habits effect a big difference. Now, get your personal fitness companion of great functionality and look!